When I think of ornate my mind immediately drifts to the big, old churches of Europe. Every time I visit one of these ancient sacred spaces I stand in awe at what the master craftsmen of old accomplished under such punishing circumstances. How DID they do it?!! As Northern Europe’s largest consecrated Medieval Gothic space, York Minster is also one of the world’s largest Medieval Gothic Cathedrals. It took 250 years complete. The Lantern Tower, at its centre, was built 1407-1423. It’s height is 235 feet (71m). For an interesting look at other British historic events that occurred during the construction of the Lantern Tower, check out TimeLine. 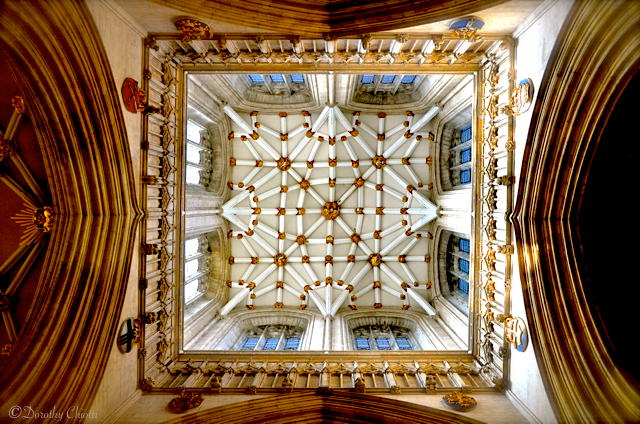 This entry was posted in Photography, Travel, Weekly Photo Challenge and tagged Cathedral, Dorothy Chiotti, Lantern Tower, ornate, postaday, Travel, Weekly Photo Challenge, York Minster. Bookmark the permalink. Beautiful and I too always wonder, how did they do it. Regards. Wonderful shot & definitely ornate. No wonder it took 250 years to complete….